National property and construction consultancy Wakemans has been appointed on a quartet of industrial developments with a combined value of £29 million – including the first speculatively built schemes to come into key local markets for some time. Wakemans is acting as Employer’s Agent, Quantity Surveyor and Principal Designer on behalf of Trebor Developments. Known for working closely with occupiers to meet their requirements, Trebor also specialises in speculatively built accommodation for immediate occupation and is engaged in a national roll out of development in the mid-box industrial sector. Currently in the design and planning stage, three of the shell unit developments are located across the South West in Bristol, Avonmouth and Swindon, and one is in Telford, Shropshire. In Hortonwood, near Telford, Trebor Developments is to build a 70,000 sq. f.t industrial unit. With junctions 4 and 5 of the M54 motorway just three miles away, the estate is centrally situated with easy access to the Midlands motorway network. In Bristol’s Western Approach Trebor Developments and its long-term strategic partner, US developer and investor Hillwood, have acquired 14.5 acres within the South West’s premier logistics park, Western Approach Distribution Park. Three high quality industrial/ manufacturing/logistics units ranging in size from 34,000 sq. ft. to 135,000 sq. ft. will be built on this site, which benefits from excellent links to the heart of the UK’s motorway network. Six warehouse/industrial units totalling 150,000 sq. ft. will be built adjacent to existing distribution accommodation on the Portside B1(c)/B2/B8 development site in Avonmouth on a development led by Trebor and funded by Barwood Capital. Portside enjoys good connections to the (A403) main arterial route that links the M5 at Avonmouth to the M48 at Aust. Wakemans is supporting Trebor Developments on a quartet of industrial projects with a combined value of £29 million, including speculative schemes. Two units of size 40,000 sq. ft. and 35,000 sq. 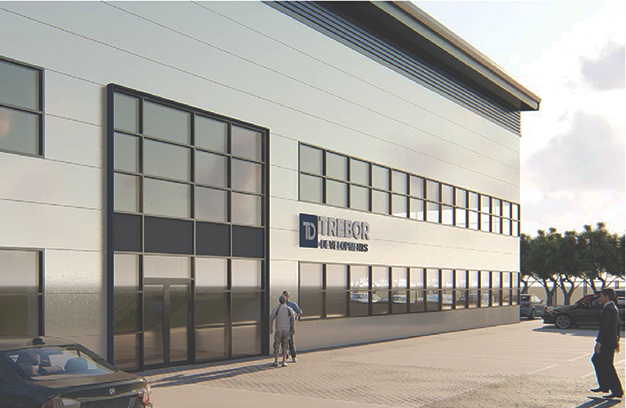 ft. and suitable for logistics operations or as industrial accommodation, will be constructed next to existing commercial buildings at Trinity Park in Hillmead, north-west Swindon. A well-established locality for logistics, Trinity Park enjoys excellent links to the M4 and M5. This development is being built under the Trebor/Hillwood strategic partnership.